Melissa and Mary got married at the Hotel at the Lafayette! 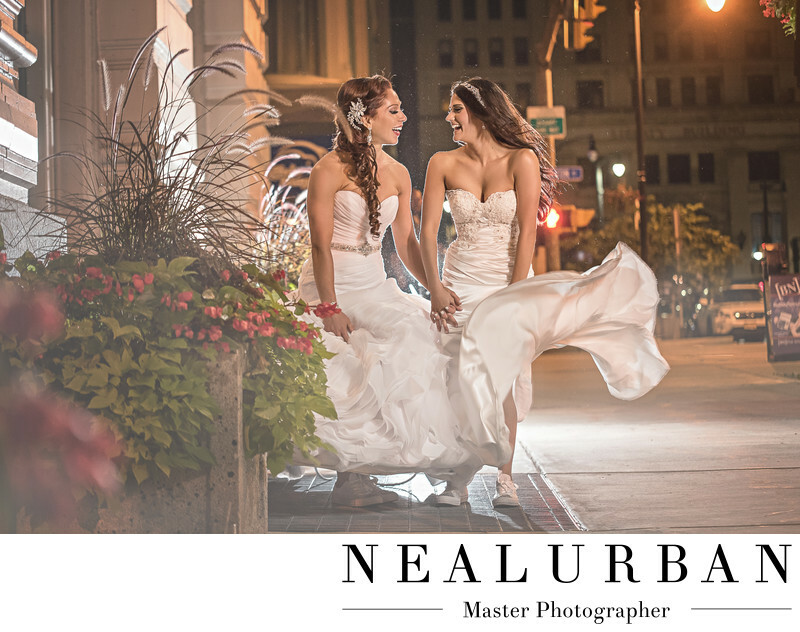 This was our first gay wedding that both ladies wore wedding dresses! And they each had their own style! They both looked stunning! They did a first look at the hotel as well as photos right on location! We love to work at this venue. It has a rustic feel. Their ballroom was gorgeous. They did a pink ombre theme! During the reception, we brought Melissa and Mary out for photos! This image actually came to mind earlier in the day. After the ceremony, we did family portraits in front of the hotel. There were two flower girls in the party. One of them was Melissa's daughter! She was a doll. The other girl was her cousin. We heard the girls laughing and noticed them standing on the air grate. Their flower girl dresses were blowing around everywhere! We decided we wanted to do the same thing with Melissa and Mary! These ladies had such a fun time in this photo. They were laughing and enjoying their time together. This was one of the only times that day they got to spend together with nobody around. Besides us taking the photos. One of my favorite parts of this image, aside from their gorgeous smiles, were their sneakers! The both had on heels for the ceremony, then they changed into matching converse! It was so cute! And much better for dancing! We loved the flowers in the foreground for this image.It added some really pretty color and a nice feminine touch! Location: 391 Washington St, Buffalo, NY 14203.